The hotel is near the park and zoo (Zoologischer Stadtgarten) and the main train station is a short walk away. There are also excellent public transport links to city rail lines and bus routes. The castle in the city center is a few minutes' drive away. Enjoy an even better night's sleep in your Sweet Bed by ibis double bed. This bed has been newly developed down to the last detail, with comfort in mind. Your room has 24-hour WIFI access, a desk and a flatscreen television. Maximum sleeping comfort for two: The twin Sweet Bed by ibis beds will ensure that you enjoy a particularly good night's sleep. The wide number of channels on the flat-screen TV will keep you entertained, and your room has WIFI access and a desk. Your Studio Suite offers even more space: our 1 to 2-person Sweet Bed by ibis double bed guarantees a wonderful night's sleep. You can also sit back and relax in a comfortable armchair. With free WIFI, desk and flat-screen TV. Surprisingly quiet although next to the train station. Room was clean and bed comfortable. Bathroom was too much of a plastic cabin but good enough for staying one or two nights. Breakfast had good variety for choice. The staff was friendly and helpful. I wanted to leave a bag at the hotel until the afternoon and that was no problem. The breakfast was good and location cannot be beat. The Ibis Hbf Karlsruhe provided me with very adequate accommodation for 3 nights. The room was good and clean. Somewhat simple but perfectly adequate, as one would expect for a hotel in this range. Staff were friendly and helpful. No shortcomings that I remember. Our stay in the hotel was awesome. I would defiantly recommend it. Great stay wit appropriate services. Nice room and location. Bathroom could be cleaner. There were a couple curly hairs in the shower. Disappointing vegan options for breakfast. Fruit and soy milk is not a breakfast. Additionally the internet speed could be higher and more reliable. Very attentive staff: asking if receipt should be made out to a company. Everything was there, worked as expected from a hotel of the category / price range. Quiet large room. Comfortable bed. Professional and nice staff. I returned to this hotel for one night exactly one year after my first visit to Karlsruhe. 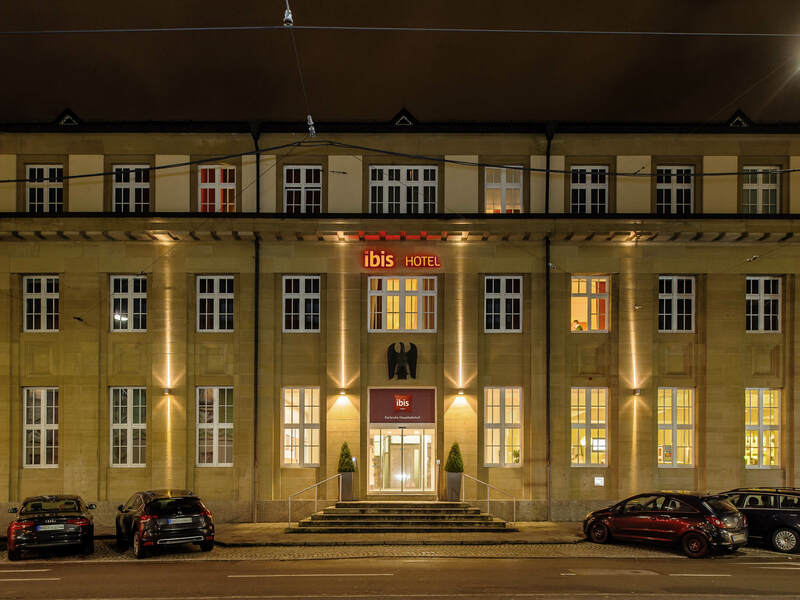 This Ibis is extremely comfortable, with atypically large rooms and windows (the building is the former central post office of the city), very quiet, impressive design, and friendly, helpful staff. It is located a few steps from the central train station (walk on the right for about one block, pass the current post office and turn right at the first lane. The first sign direct to the Ibis parking space. Pass that sign and keep walking. The lane leads to the main entrance of the hotel. The lane is actually a small street accessible to cars, buses, and taxis. When I'm on a multi-day stay @ a hotel, I don't want housekeeping bothering me every morning. I don't need trash taken out, or new sheets/towels every day. Don't do it @ home. Anyway, they respected the &quot;Do Not Disturb&quot; placard on the door throughout my stay. Price was good, clean room. Have stayed there the last 4 years and plan to return in 2019! Everything you'd expect and hope for from an Ibis to a very high standard. All the staff members I dealt with were very friendly and efficient. Would certainly stop here again. I have been to Karlsruhe for years now but this was actually my first stay at the Accor Hotel. The rooms are really cozy and spacious; I like the fact that they chose to have no carpet in the rooms - it makes them cleaner and healthier for people with respiratory allergies. The shower cabin is extremely large and comes with glass doors - another sign that they care about cleanliness. I did not find the bedsheets comfy at all; they felt sort of dried up and difficult to slide into; a pity after reserving a queen size bed. The automatic invoicing system was not so automatic after all, but the personnel helped immediately out. The location of the hotel is ideal: right in front of the tram stop and two minute walk from the main entrance of the railway station. Hard to pull up the luggage at the entrance of the hotel: the ramp for the bikes does not work well for suitcases and the stairs are not quite practical when you come overloaded. I did not try the breakfast room or the bar; I let you do that and share! I booked this at the last minute. I was very happy with the stay and if I came to Karlsruhe again I would likely choose to stay here. Everything went well from the check in to the breakfast. The room was clean and very comfortable. A great place to relax and very convenient to the train station.